The bathroom is one of the dirtiest places and the one with the biggest concentration of bacteria and fungi in the home. Since this is where we clean our body, and we constantly use it, it is important to be cleaned properly. If you have small children or pets, it is critical to disinfect thoroughly all rooms where there is a lot of moist and vapours, in order to prevent the developing of potentially dangerous microorganisms. That said, there is no need to scrub the bathtub or to pour bleach in the drains every day. 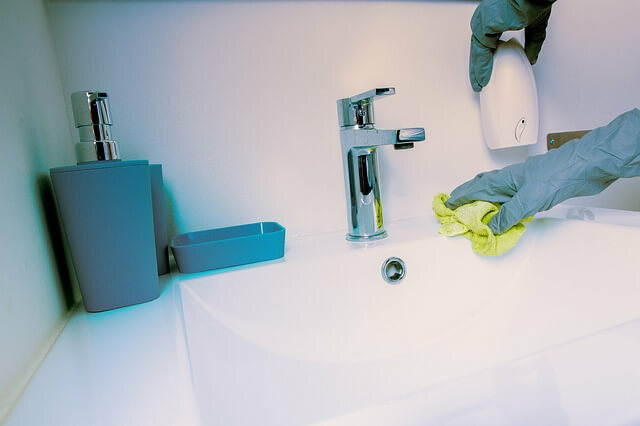 Here are some easy steps to keep your bathroom and your home clean and bacteria-free. The sink is the thing you frequently use the most in the bathroom and it needs special attention. Wipe the inside of the sink with a soft wet towel. Make sure to remove all hairs from the drain and all spots from toothpaste. Rinse the sink with water and clean it with a bathroom cleaner. If you do not want to use any chemicals, you can try a mix of water and vinegar. Pour drain cleaner according to the instructions on the bottle. Some have to be washed with cold water, others need hot/boiling water. Be extremely careful not to burn yourself and always wear gloves. After the drains, it is time to clean the faucet. Usually, most have a chrome surface so search for a cleaning solution that won’t damage or stain it. You can also use an old toothpaste. Scrub gently with a small brush and rinse it with water. Wipe the inside and the outside of the sink with a soft cloth to get rid of any leftover moisture. You know it is dirty, we know it is dirty, now let’s get cleaning! Buy a cleaner containing chlorine or ammonia and get yourself some protective gloves and a mask. Never mix those two chemicals, that is highly dangerous. Make sure to secure a constant air flow before and after you use strong cleaners. Get a soft cloth, dip it into a solution of water and a little cleaner, and wipe the outside of the toilet, the lid and the toilet seat. Pour cleaner into the toilet and under the edges. Make sure you are familiar with all the instruction on the bottle. Let it sit for 10 to 15 minutes. Exit the bathroom during this time. Rinse the toilet with water. Mirror, mirror on the wall, why are you always this dirty. It is easy to answer this question. When you take a bath there are a lot of vapours, that condense on the surface of the mirror thus the constant white spots. The same goes for your glass shower doors. Use a microfiber cloth and a window cleaner. Spey on the glass surfaces and wipe it with the cloth. Use kitchen paper to polish the mirrors and doors afterwards. We all love to take a nice relaxing bath and somehow always forget to clean the bathtub. Now the time for cleaning action has come. Put those gloves and let’s get started. Get a wet cloth and wipe the whole tub, be sure to clean the outside of the drain. You can use the sink cleaner to clean in a similar way the tub. Clean all the chrome surfaces with toothpaste or a specialised solution. Pour drain cleaner and follows the instructions on the bottle. While the drain cleaner is doing its magic clean the shower head. Here once more you can use vinegar instead of other cleaning chemicals. Rinse with water and wipe everything with a dry cloth. After you disinfected and washing everything in the bathroom it is time for the finishing touches – tiles and floors. If you live in a humid place, like London you need to take special care when it comes to getting rid of the mould in the bathroom. Some special cleaners for tiled floors have a nice refreshing scent and can mask the one left from the drain and toilet cleaners. The other option is to use professional cleaning help and order a steam cleaner that can dry, clean and disinfect all at once. Get an old toothbrush and use it to clean the black and orange mouldy spots. Make a solution of water and toilet cleaner and use it as well. The chlorine or ammonia will kill any fungi or bacteria. Use a microfiber cloth to wipe dry the floor and tiles. Congratulations, after a hard day of scrubbing, your bathroom is spotless and disinfected!